Riotously colorful, Barbakoa, a Jerry Kleiner venture, is a perennially packed hub for Nuevo Latin fare that’s meant to be shared, such as platters of tacos and guacamole, salsa and ceviche trios. There’s paella, too, plus a tasting menu for parties of four or more. The creative cocktails are of note as well. Barbakoa, 1341 Butterfield Rd., Downers Grove, IL 60515, 630-852-2333. Counter-service and casual, Honey Butter Fried Chicken is the go-to from Sunday Dinner’s Joshua Kulp and Christine Cikowski (Blackbird, Milk & Honey), only here it’s all about namesake poultry, served with honey butter. Expect more-interesting-than-average sides, too, like beans in heirloom tomato sauce. Honey Butter Fried Chicken, 3361 N. Elston Ave., Chicago, IL 60618, 773-478-4000. Modern Mexican makes its way to the far west ‘burbs at Puebla, which is set within the old Wild Monk and Prasino location in St. Charles. Michael Tsonton (Courtright’s, Copperblue) was the consulting chef, and there’s a tequila line-up 50 strong. Choose between six salsa and six guac styles, moving on to grilled mahi mahi with mango salsa or lamb barbacoa tacos, and finishing with vanilla and chocolate-filled churros. Puebla, 51 S. First St., St. Charles, IL 60174, 630-945-3408. Old Crow Smokehouse offers a familiar, if Asian-tinged, formula of baby-backs, honky-tonk and bourbon, in a setting honed from reclaimed wood. It’s backed by the crew behind John Barleycorn and Moe’s Cantina, and the grub --- pulled pork egg rolls, Chinese lamb with sticky rice, brined, smoked chicken --- comes from MasterChef alum Tony Scruggs. On weekends, there’s live music and an all-you-can-eat deal. Old Crow Smokehouse , 3506 N. Clark St., Chicago, IL 60657, 773-537-4452. There is much to like about The Dawson, a venture from Billy Lawless (The Gage, Henri) and Branko Palikuca (Topaz Cafe, Amber Cafe). The kitchen preps buttermilk-fried Prime rib-eye with horseradish mashed potatoes, country gravy and buttermilk biscuits. The Dawson, 730 W. Grand Ave., Chicago, IL 60642, 312-243-8955. The Hot Woks Cool Sushi owners are behind Asian Outpost, a spot for rustic-modern Asian fusion inspired by family recipes. That means dishes like garlic-ginger fried chicken and Grandma Lee's “famous steak,” sliced, Hong Kong-style New York strip with garlic and oyster sauce. Asian Outpost, 1315 S. Wabash Ave., Chicago, IL 60605, 312-662-1100. Azzurra comes courtesy of Marty Fosse (Anteprima, Acre, Bar Ombra), who knows his way around Italian fare. Here, it plays out simply, in an unpretentious setting in Wicker Park. A shareable spirit pervades, so expect the likes of crostini, stuffed farro arancini and pork loin wrapped in pancetta. Azzurra, 1467 N. Milwaukee Ave., Chicago, IL 60622, 773-278-5959. Jeff Mahin and Lettuce Entertain You opened Stella Barra Pizzeria, an industrial-feeling sister spot to Cali-style Summer House Santa Monica. The edited menu offers California-style red or white-sauced pizzas, meatballs and pastas, plus a list of boutique wines, craft (and draft) cocktails and microbrews. Stella Barra Pizzeria, 1954 N. Halsted St., Chicago, IL 60614, 773-634-4101. California-inspired American fare is the draw at Jeff Mahin’s (Do-Rite Donuts & Coffee) bright, airy haunt, Summer House Santa Monica, which highlights locally sourced ingredients for its salads, pasta, pizza and seafood dishes. Summer House Santa Monica, 1954 N. Halsted St., Chicago, IL 60614, 773-634-4100. Matthias Merges’ Italian/French A10 offers up the likes of roasted garlic soup inflected with poppy seeds and green onions; wood-fired snails with rosemary oil; and a smoked Berkshire pork chop with Honeycrisp caponata and sage. Finish with a chocolate beignet, accented by toasted meringue and hazelnuts. A10, 1462 E. 53rd St., Chicago, IL 60615, 773-288-1010. Gaston Acurio has fashioned one impressive Peruvian spot in Tanta, though it’s no surprise given he runs over 30 in 12 countries, including Astrid y Gaston in Lima, Peru. Here, though, the vibe is casual, with a lineup of ceviches (get a tasting), anticuchos (skewers) and Chinese-inspired Del Chifa dishes. Then there’s the signature pollo a la brasa, brined, crisp-skinned chicken with stewy white beans and arroz con choclo, rice stippled with big kernels of Peruvian corn. Finales include mazamorra crumble, a fruit crumble with almond crust. Tanta, 118 W. Grand Ave., Chicago, IL 60654, 312- 222-9700. Built in 1892 by John Dusek as a public hall, Thalia Hall has been re-established as Dusek’s, where Jared Wentworth (Longman & Eagle) joins Bruce Finkelman and Craig Golden in offering a spot where American, Southern and Asian flavors shine. Expect dishes like fresh-shucked oysters; luxurious, butter-poached Maine lobster with smoked carrot purée, a trio of beans and black trumpet mushrooms in ramen broth, with Wittekerke; or a deviled pigtail rillette, plated with sweet, carrot-cucumber relish, fried potatoes and a paprika-cured egg yolk, then finished with celery foam. Be sure to get the seasonal ice cream sundae for dessert. If it’s caramelized honey ice cream with confit quince, warm quince syrup, lemon cream, maple praline walnuts and a shower of pomegranate seeds, you’re in luck. Dusek’s, 1227 W. 18th St., Chicago, IL 60608, 312-526-3851. Dan Rosenthal (Trattoria No. 10) is behind Venetian newcomer Cicchetti, where veteran chef Michael Sheerin (Blackbird, Trenchermen) is in the kitchen, creating buzz-worthy Italian/Mediterranean plates. Not to be overlooked in this dream team is Phil Rubino (Acadia and Spiaggia) as sous chef and Sarah Jordan (Blackbird, Boka), who is whipping up desserts. The focus is on Venetian tapas, and that means Fontina-topped flatbreads with portobellos and crispy garlic; duck liver bruschetta with cocoa nibs; and ravioli filled with braised short ribs. Cicchetti, 671 N. Saint Clair St., Chicago, IL 60611, 312-642-1800. Paul Kahan has opened a rustic, seafood-centric Italian spot, Nico Osteria, in the Thompson Chicago. Good luck finding a table. If you do, however, you’ll be rewarded with Erling Wu-Bower’s Maine mussels in almond butter broth, whole-roasted fish and quail al'tonnato (quail in creamy tuna sauce), followed by pastry chef Amanda Rockman’s grapefruit meringata, rosewater-infused grapefruit with meringue and white chocolate Chantilly. 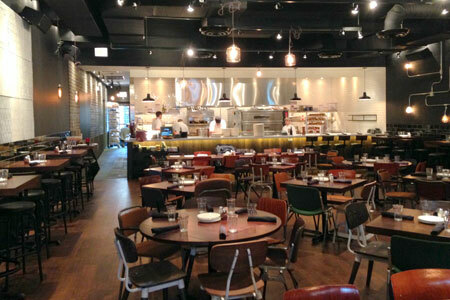 Nico Osteria, Thompson Chicago, 1015 N. Rush St., Chicago, IL 60611, 312-994-7100. Roy's is offering a winter prix-fixe menu that will be available through March 23, 2014. Start with lobster bisque followed by pork osso buco. Butterscotch and miso budino provides a sweet ending. The cost is $36.95 per person (tax and gratuity not included). Roy's, One Superior Place, 720 N. State St., Chicago, IL 60610, 312-787-7599. The Southern’s chef Cary Taylor has moved to Paul Kahan’s Big Star, where he took over for Justin Large. Taylor previously worked with Kahan at Blackbird. Big Star, 1531 N. Damen Ave., Chicago, IL 60622, 773-235-4039. Lee Wolen is now the executive chef at Boka, replacing Giuseppe Tentori (GT Fish & Oyster). Boka, 1729 N. Halsted St., Chicago, IL 60614, 312-337-6070. Sarah Grueneberg has stepped down from her executive chef position at Tony Mantuano's Spiaggia. Chris Marchino has taken over. Spiaggia, One Magnificent Mile, 2nd Floor, 980 N. Michigan Ave., Chicago, IL 60611, 312-280-2750. Ryan Poli left his positions at Mercadito Hospitality spots Tavernita and Little Market Brasserie. Guillermo Tellez, a Mexico native and Charlie Trotter alum, has assumed the roles. Poli remains a partner. Tavernita, 151 W. Erie St., Chicago, IL 60654, 312-274-1111. Patrick Fahy left Sixteen and has re-emerged at Thomas Keller's The French Laundry. Aya Fukai has replaced him at Sixteen. Sixteen, Trump International Hotel & Tower Chicago, 401 N. Wabash Ave., Chicago, IL 60611, 312-588-8030. Chris Curren is no longer running the Fifty/50 Group’s restaurants (Homestead, The Berkshire Room, West Town Bakery and Diner). Chris Davies (Acadia and Henri) is taking over at Homestead and The Berkshire Room. He will also oversee West Town Bakery and Diner with pastry chef Chris Teixeira. Davies previously worked with Curren at Blue 13. The Berkshire Room, ACME Hotel Company, 15 E. Ohio St., Chicago, IL 60611, 312-894-0800. William Johnson vacated his position at Filini. He’s now at Dine in the Crowne Plaza Hotel Chicago Metro. Filini, Radisson Blu Aqua Hotel Chicago, 221 N. Columbus Dr., Chicago, IL 60601, 312-477-0234. Rosalia Barron has left the role of executive chef at Signature Room at the 95th. No word yet on her replacement. Signature Room at the 95th, John Hancock Center, 875 N. Michigan Ave., Chicago, IL 60611, 312-787-9596. Jerome Bacle, of shuttered Courtright’s, is now the chef of Bistronomic, where he’ll preside over the kitchen for executive chef/owner Martial Noguier. Bistronomic, 840 N. Wabash Ave., Chicago, IL 60611, 312-944-8400. Chickpea’s casual Middle Eastern fare is a thing of the past. The family-run business, helmed by Jerry Suqi, did not renew its lease. Chickpea, 2018 W. Chicago Ave., Chicago, IL 60622, no phone. Shin Thompson’s (Bonsoirée) Japanese brasserie Kabocha closed up shop after less than a year in business. Kabocha, 952 W. Lake St., Chicago, IL 60607, no phone. Susan and Drew Goss have closed their beloved West Town Tavern and have since relocated to New Orleans. West Town Tavern, 1329 W. Chicago Ave., Chicago, IL 60622, no phone. After 13 years, Randolph Street stalwart The Tasting Room is no more. The Tasting Room, 1415 W. Randolph St., Chicago, IL 60607, no phone. Oon, the spot from Matt Eversman, closed up shop less than six months after opening. Oon, 802 W. Randolph St., Chicago, IL 60661, no phone. Chef Graham Elliot's eponymous restaurant graham elliot has shuttered. graham elliot, 217 W. Huron St., Chicago, IL 60654, no phone. Storefront Company in Wicker Park has shuttered. Storefront Company, Flat Iron Building, 1941 W. North Ave., Chicago, IL 60622, no phone.